Slow Cooker Rotisserie Chicken - tastes better than store-bought chickens! SO easy. 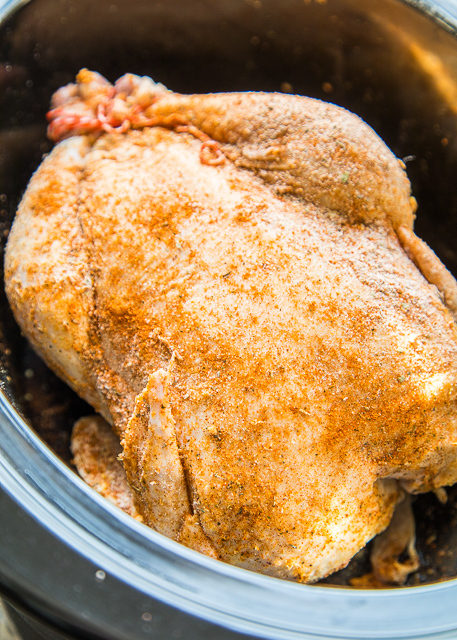 Rub spices on the chicken and pop in the slow cooker. Put cooked chicken under the broiler for a bit to crisp up the skin. Great for dinner or shred chicken and freeze to use in casseroles later. 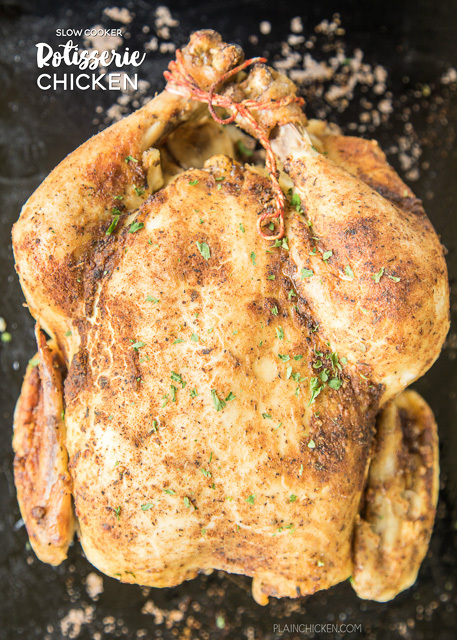 Everyone LOVED this easy slow cooker chicken recipe! We have a deep love of rotisserie chicken in our house. They are our go-to for easy dinners and all the cooked chicken in our casseroles. So, when my Mom gave me a recipe for a Slow Cooker Rotisserie Chicken, I knew I had to make it ASAP! OMG! Y'all this is ridiculously good and SUPER easy to make. I just rubbed some yummy spices all over the bird and plopped it in the slow cooker. Everybody in the house LOVED the chicken - especially Fluffy and Squeaky. They were following me around begging for chicken. I gave them each some and they licked the plate clean. So did we! This chicken was so tender and juicy. I slow cooked a 6 pound chicken. We enough for all of us to eat dinner and shred some to use for casseroles later. As I said, this Slow Cooker Rotisserie Chicken is super easy to make. You can rub the chicken with the spices the night before and put it in the slow cooker before you leave for work or school. Can't get much easier than that!! I like to pop the cooked chicken under the broiler for a bit to crisp up the skin. That is totally optional. If you aren't eating the skin, then you can skip that step. 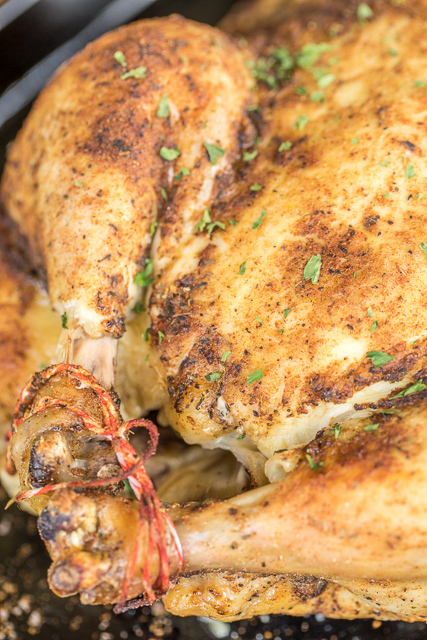 Either way, this Slow Cooker Rotisserie Chicken is a winner, winner chicken dinner! Remove and discard giblets and neck from chicken cavity. Rinse chicken with cold water; pat dry with paper towels. Tie legs together with kitchen twine or cotton string. Combine flour, paprika, onion power, Italian seasoning, garlic powder, pepper and salt. Rub chicken thoroughly with seasoning mixture, including inside the cavity. Place chicken, breast side up, in slow cooker. Cover and cook on LOW for 6 to 8 hours. For crisper skin, broil 5 to 7 minutes in a shallow baking dish before serving. Good Morning, Would you want to rub the cavity with seasoning and then truss the chicken up? Recipe sounds great and convenient. I did season the chicken and then tie up the legs. I don't think it really makes a difference in the order. I roll up 3 or 4 balls of foil to place in the bottom of the cooker. Place the chicken on the foil to keep it from resting in all the liquid. I use the juice to serve over the chicken or to moisten it before freezing. You can build a platform of sliced onions and carrots to sit the chicken on. YUM! Also, wouldn't Squeaky, Fluffy and dear old Jack like those innards? I love Meow Monday, esp. Jack. Thanks!